Sorry, Kanger Aerotank V2 has been discontinued. Kanger Aerotank V2, variable airflow, with bottom dual coil, 2.5ml capacity. The Kanger AeroTank V2 is the latest addition to the Aero series of variable airflow tanks (or clearomizers) from Kangertech. 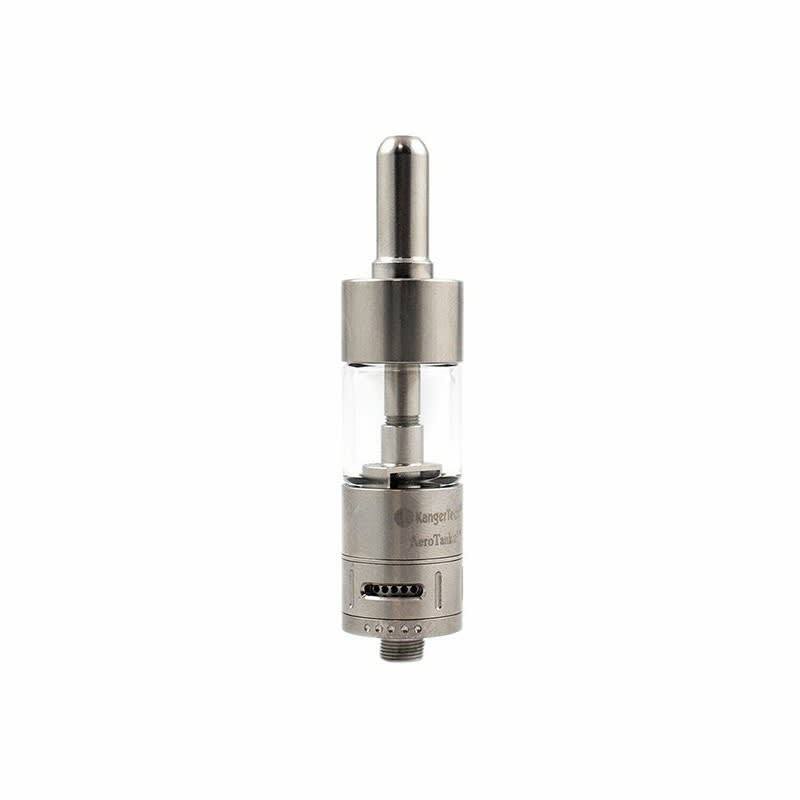 It is designed to fit 510 type battery threads, is made of a food grade stainless steel body with a durable pyrex glass tank of 2.5ml to hold the liquid, a removable metal drip tip, and uses the lastest Kanger Organic Cotton Dual Coil (1.8ohm) technology, producing more vapor than the old type of coils with the exposed wick, and causing less leaking problems. The new and improved design of the variable airflow ring at the base of the tank, offers you even better control than before. It allows you to change the type of draw you get from your device, with a tighter airflow, you pull a little bit more on your tip, drawing the vapor mostly directly to your lungs, like in most standards clearomizers, but with a wider airflow, the vapor builds up more slowly in your mouth, you get more flavor, and blow out a bigger cloud of vapor! The airflow ring is variable, offering you the possibility to find the sweet spot for you! As with every tank, typically one coil will last 3-4 weeks for most users, after that you should get a burnt taste in your flavor signifying that you need to replace the coil of your tank / clearomizer. Out of Kanger's tanks that use dual coils, this is the best. Clean airflow, great tank size. Unless you're going to go sub-ohm, you're not likely to find much better of a tank!